Fabulous summer weather has resulted in gardens taking over lounges as our real ‘living rooms’. But, as autumn looms, we can’t help dreading once again being cooped up indoors. 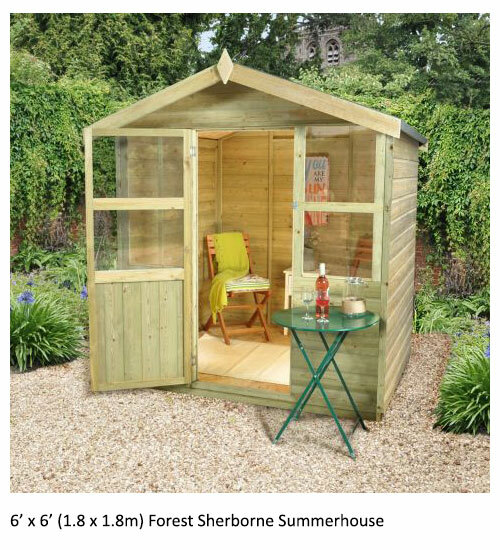 Don’t despair, here at Shedstore, we have a sure-fire way to prolong your garden-based glee. For, this autumn, there’s no need to join the mass exodus out of the garden and back into the house. No, not once you’ve bought a summerhouse. Imagine how you could utilise your new garden room: a place to spend time with the family and appreciate those wonderful autumn colours; somewhere to entertain friends, perhaps for a Bonfire Night gathering; a tranquil location to relax with a good book; or maybe you will transform your life by using it as a home office. That’s got you thinking, hasn’t it? Why not read on to find out more about 3 of Shedstore’s market-leading summer houses and then take time to browse through our fantastic full range? Picture yourself sat inside this charming garden room, relaxing with the Sunday newspapers, enjoying complete peace and quiet, but occasionally looking up to admire, at close quarters, the beautiful autumn shades in your garden. 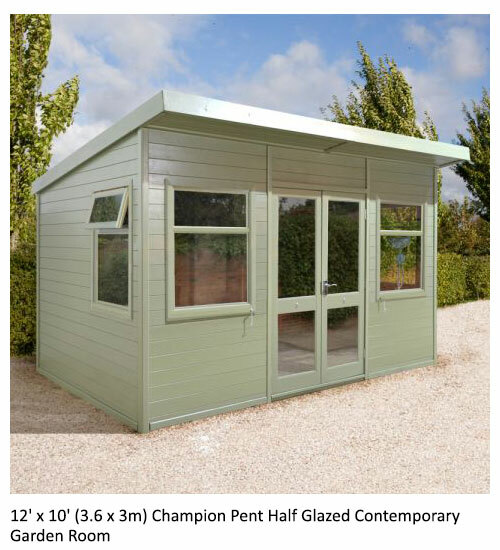 Constructed from superior tongue and groove shiplap cladding, pressure treated, and with a fantastic 15-year anti-rot guarantee, this compact summerhouse enjoys a sand felt roof covering to keep out the rain, as well as a bolt locking system for that added bit of privacy. And if a stray football crashes, at full force, against one of the windows? Well, there’s no need to worry about that because they’re all made of near-unbreakable styrene. Imagine yourself on a Monday morning, eating breakfast and watching the news. Apparently, the train drivers are on strike and there’s been another temporary road closure, close to where you live. You feel for your commuting friends but it’s no longer your concern. You put on your favourite jogging bottoms, a big, baggy jumper, a pair of comfy slippers, and stroll out into the garden where your new home office awaits you. Made in Great Britain, pressure treated and with a fantastic 15-year guarantee, this sensational summer house boasts fully glazed double doors and 4 additional windows, so the interior always enjoys an abundance of natural light. What’s more, the doors are lockable, so you can leave your office equipment inside without any concerns. Envisage yourself sat with your family inside this wonderful log cabin, excitedly chatting about your forthcoming skiing holiday. Amidst the happy faces, you take a moment to appreciate your current surroundings. Your garden room actually has the look of a ski chalet, you decide. Now that autumn is in full-flow, the sun is hanging lower in the sky, but the large roof overhang keeps its glare out of your eyes. You admire the 19mm interlocking log walls, 12mm tongue and groove floor and roof, weatherproof felt roof covering, and smile in satisfaction at the thought of the 10-year anti-rot guarantee. This log cabin certainly does keep out the autumnal weather. 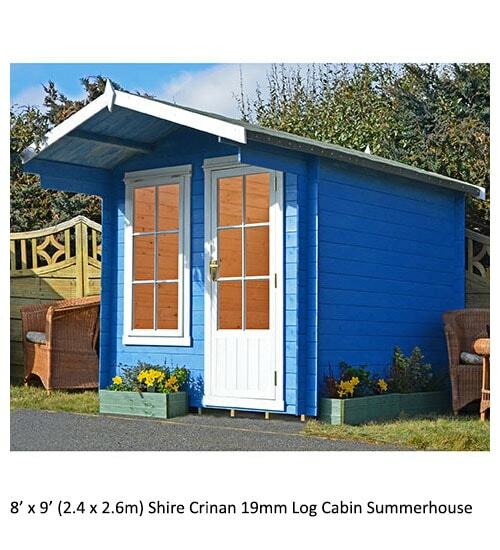 A thought occurs to you: why did Shedstore call it a summer house when it’s perfect for autumn too? Why not enjoy the delights of your garden all-year-round? 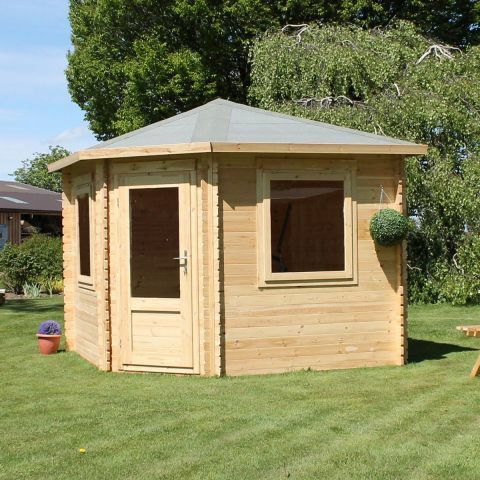 Here at Shedstore, we stock summerhouses (a.k.a. all-year-round houses) in all shapes and sizes, catering for every conceivable taste and to suit any budget. Click here to view our fantastic full range of summerhouses and don’t forget that our UK-based customer service centre is always on-hand to offer you expert advice.